Here is my Operation Write Home Memorial Day Bloghop card featuring a faux verdigris technique and OWH sketch #68. Get more details about the faux verdigris technique and sketch. After many comments about the Memorial Day Poppy, I wanted to share some history. During World War I, a battle zone was described by an American pilot as a “brown belt, a strip of murdered Nature.” In April and May of 1815, poppies began to appear in clusters around these battered fields. Their bright, vivid color was a sign of life in an otherwise barren area. While I remember getting Memorial Day cards with red poppies as a child, I didn’t fully understand the meaning of the red poppies. The many comments about the flower on my card inspired me to share this story about Memorial Day Poppies. Beautiful poppy-like flower - reminds me of the Memorial Day poppy! The verdigris technique gives a very subtle shading - good color combo. Gorgeous card...love the flower and the background technique is stunning. thanks for the faux verdigris technique instructions, your background is wonderful. Love the colors. TFS. Very pretty. Nice use of this technique. Really pretty colors and I love your orange flower. Nice technique too! This is beautiful! Thanks for sharing the instructions for the faux verdigris. I can't wait to try it. Very nice-the colors are pretty and this technique is interesting, too! TFS! I entered all 3 ways; thanks for the chance to win!! Thanks for including a link to the instructions! That is my favorite part of your beautiful card! I love the technique you used with the inks and embossing folder- it turned out fabulously. I did join your facebook page and added getting your newsletter. Beautiful card! !your flower focal point is great and the background is awesome! Thanks for the link to the tutorial, I can't wait to try it! I love the colors you used as well as the wonderful texture that the embossing and the flower add! The background is amazing! I'll have to be sure to bookmark the technique so I can try it out when I have time to play! Thanks again for sharing and for creating for OWH! This is so pretty! Thanks for sharing the instructions; I'm going to have to give it a try! HI Sharon! Great card. Love the big flower and the colors you used. I liked you on FB and already receive your newsletter! Lovely card. I'm definitely going to have to stop back by to learn that technique. Love the colors. The flower really pops. Thanks for the tutorial. Wonderful card. I haven't heard of the faux verdigris technique before. I will be back to learn more. Thanks for sharing the instructions ! love the colors you used. Wow, the faux verdigris background is gorgeous...I will have to try that out. I love all the great ideas I get from blog hops! Thanks for sharing. I really like the faux verdigris technique, so unique. Tfs. Hi Sharon! Stunning card, but then all your cards are stunning. Love getting to learn a new technique. I like the simplicity of the layout as so many cards today seem to be "gee just how many patterns of DP can I use?" I really love the COLORS YOU USED! Such a beautiful card! Thanks for sharing the tutorial. I loved the result. That flower is perfect, size- and placement- wise. It looks flat enough for an OWH card, too. I like the Moroccan feel to this card, great layers! I have never heard of faux verdigris before. Love this! Love the poppy and all the detail. oh my, that background paper is amazing! I don't have time now, but need to come back to find out about that verdigris technique! I just "liked" you on facebook so I can find my way back here....thanks! Thanks for sharing the faux verdigris technique. I love that it seems more complicated than it really is! What lovely colors and even more lovely card! Thank you for sharing the instructions, as I will be trying this technique soon! great idea!! a really good sketch too - I am going to have to try it out!! What a beautiful card! I am on my way to check out the tutorial! Love the technique very pretty. The orange gives the contrast and really makes the panel stand out...I am going to try that technique...a very beautiful card..thank you for sharing, oh and the hello sunshine card on your tutorial page is stunning. What a great technique! I really like how well you blended those 4 SU colors for the background. At first glance, I thought it was done with air brushing. I love the technique you used. I will be checking out the tutorial for that one. Very pretty! Love the technique & colors! Thank you for the new technique, I love the look. Love the color combo! Will check out your link to the technique...think I know how you did it, but we'll see. The poppy is a good choice for today's Memorial hop. Love that inking technique. I am going to have to try that. Love the verdigris look. Beautiful card! What a pretty card! I'm heading over to view your tutorial now. Gorgeous, absolutely gorgeous! Love your verdigris technique. Such a unique and beautiful result. Gorgeous card-- love that stunning flower--great choice of colors to really make it pop! What a great technique...it really "makes" this card. TFS! This is so pretty. I like how you did the background. I'll need to try that background technique, it's pretty. Your color combination is gorgeous! I love how the orange pops against the blue and green. Thanks for the link on how to do faux verdigris. I will have to try it. Thanks also for supporting OWH. Lovely card. Really like the technique. Ann O. Love your card - it reminds me of the Memorial Day poppy flower. The color combinations in this card are wonderful. The choice of a poppy for Memorial Day is very appropriate. I really like the faux verdigris technique -- thanks for sharing. Love your card and the colors you used. That technique looks like fun. Very pretty flower. Gorgeous! Love the layered flower and the mosaic pattern background. Sharon, your card is so beautiful. I love the background technique. Thanks for inspiring. I hadn't thought of the poppy connection until I read the other comments.....I like that coloring on the paper behind the flower. Like your colors - and always love punched flowers. Your whole card is amazingly wonderful but I really like that background for the beautiful flower. Love the colors too. Very pretty card. Great details and colors. Your card is so pretty. I love the big flower! I am a new like on your FB and signed up for your newsletter as well. Love the flower - really makes the card pop! Love the technique. I will have to try this one. I just love the color combination and the poppy! It just "pops" off the page. Thanks for the inspiration. Beautiful card, Sharon, beautiful technique! Love your colors as well, TFS! Hope you have a fabulous weekend! I am south of you in the Austin area, I enjoyed our rain yesterday. So in love with the color combo the back ground is super cool! Very pretty card. Love the flower that you used! That faux verdigris technique is beautiful. I love how you higlighted it by mounting it against a complimentary color. Thanks for your participation in the OWH Blog Hop! I'm looking forward to using the verdigris technique myself! I love the colors you used. Very pretty! Such wonderful colors - truly a beautiful card! I like everything about your card. Beautiful card! I especially love the way you enhanced the embossed background! Love the faux verdigris technique! Your flower really pops on the background! I liked you on FB and signed up for your newsletter! Glad I found you & TFS! I love using flowers on the cards I make and your orange flower is great. I love the card and the use of the verdigins technique. The flower reminds me of the poppies you always see with this holiday. Great going! Thanks for sharing your technique with this lovely card. Simple yet beautiful with the floral touch. Cute card! The background technique is great. Thanks for supporting OWL. Love the verdigris background. Thanks for sharing the technique. Love the poppy and the colors. Thanks for the tute! I love learning new techniques. Love the technique coupled with the embossing folder. Just beautiful. Thanks for sharing. Nice colors - the textured part in the middle - really like that. Love the technique you used with the embossed paper. Thanks for sharing your ideas. Beautiful card! Thanks for going into detail about how you did the faux verdigris technique--I will have to try that! Thanks for your offer of blog candy too--I love winning free stuff! Blog candy giveaway on my blog too! Happy Memorial Day Weekend! Love how you made the background accent piece. Thank you for showing us the step-by-step instructions. What a pretty card! Great job on the faux technique! And the flower just pops off the card. TFS! Love your card, the inking technique you used is so pretty. I am going to have to check out your directions, thanks for sharing!!!! Thank you for participating in this wonderful cause. I love how the orange color pops against your blue background. I'm really like the orange poppy and the font on the sentiment. So pretty! Thanks for sharing your faux verdigris technique! Thanks for the directions on the faux verdigris. Your card is really pretty & your color choice was great. Love this technique!! It is on my list of things to try! I have a feeling after this hop I'm going to have a long to do list! Gorgeous! The flower is so pretty and you did a fabulous job with the technique! Love the verdigris technique,so soft and adds so much depth. Bright beautiful flower...and I am loving that verdigris effect. I'm def going to try that! Beautiful colors. Love that orange flower. nice color, love the card! Love the elegant look of this card! I really like your technique, it really gives the card some dimension. I just love that technique...it makes your flower and sentiment POP! I love that pop of bright color from your flower on the blue and greens. I definitely have to check out that technique - it looks really neat and different to do! Gorgeous card - thanks for the tutorial on that verdigris technique! Love it! I love the mix of blue and coral and thanks for the details on how to do the verdigris technique! Wow...gorgeous color. 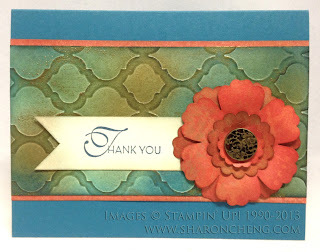 I love Stampin' Up. Love how the new mosaic folder looks. I can't wait until May 31 to order. Your technique is awesome also. Thank you for sharing! Great card, love this technique! Love the texture and the technique. Pretty card. Really cool technique! I haven't seen that before and I love how it makes that red flower pop. Love SU! and all their products. thanks for another technique I haven't tried! can't wait to try it. This is elegant and fun - I want to try it soon! Thanks for the inspiration! I like the card. Did you distress the paper? I've never heard of faux verdigris. I'm going to have to give it a try now. The colors and patterns are great! The verdigris effect is awesome on this. Thanks for sharing the link (which I've book mark for a revisit). The bold orange flower and teal look just wonderful with it too. Thanks for joining in the hop and supporting Operation Write Home! Love the flower and the colors! I love the verdigris effect. Thank you for the tutorial and for the history of the poppy flowers. I always associate the poppy to Memorial Day but never knew why. I love the orange and blue combo but the flow is what did it for me just stunning!! The poppy is the perfect flower to add to your card. The symbolism as you explained it is very cool. The colors are gorgeous as is the poppy. I love your coloring of the central panel and your color choices are terrific. Beautiful card, The background colors make your Red Poppy Pop! Love the color of the poppy and the background color....beautiful job! I liked your facebook page and signed up for your newsletter....Thank you! Beautiful flower and love the background panel to make it pop. Enjoyed your card...the flower...and bankground. Thanks for sharing the history of the poppy and for sharing your card. Beautiful card! I love the flower. What an awesome card, the colors are so pretty, that embossing folder is very classy. How pretty! Love the "poppy". I remember my dad got a little box of poppies every year from his VFW post to sell. This is such a vibrant card, very cheerful. I like the way you used the solid blue and just a touch of pattern paper so the poppy stands out nicely. Thanks for the technique, I'm going to try it on my next card. Love your poppy flower. Love the verdigris technique. Great colors! The verdigris look is gorgeous. And the poppy is so nice. Your color choices just pop on this card.TFS. Beautiful card Sharon, I love that poppy! Hi Sharon! I love the poppy! Just beautiful! Thanks so much for sharing! What a lovely card. I like the technique too. Your card in inspiring -- I have those punches and am going to try the verdigris technique, thanks for sharing. What a beauty this is!!! Loved the technique...thank's for sharing. Great seeing the SU products! Love the technique as well. Great and appropriate red poppy for Memorial Day. As a wife of a retired Vet, I appreciate the meaning as I remember the many who have given their lives so I can have the freedoms we as Americans so often take for granted. TFS and supporting OWH. This card is gorgeous! I love the poppy! I am following you on FB and I signed up for your newsletter. Thank you for the chance to win. I have done faux verdigris with acrylic paint but not like this. Gorgeous card! The flower is beautiful! TFS for sharing the story about the Poppi! I will always look differently at poppys now! and I love the verdigras technique! so fun! Thank u for sharing the story and such a lovely card! I love the red orange poppies! When I was a teenager and a cheerleader, (many moons ago), we sold paper poppies for the VFW to commemorate Memorial Day and our fallen heroes. Love your card; the verdigris is so pretty and your poppy is a great reminder of those who have sacrificed their lives for our freedom. Love your cards. Also thank you for sharing techniques on your site. Love the background but especially the poppy after your history lession. Nature can teach us a lot. Stunning card! Love the depth and symbolism! Thank you for sharing the verdigris technique. Thanks for the poppy story and great technique on your card. I love learning new techniques and will have to give it a try. Love the poppy too - perfect for the occasion. Yummy card! Your flower reminded me of a poppy right away...perfect color! tfs!!! Wonderful card. Love the pattern paper and the flower is so pretty. I love the bold color. Loved the card but was very intrigued to read about the Poppy's historical connection to Me,oriel Day"
I realy like the card. The flower really "pops" and the color combination is great. Love the faux verdigris technique. Can't wait to use it! Thanks for sharing! What a lovely card--and thanks for the tutorial! I love the technique you used! Love the verdigris technique with the orange flower - very eye catching! Very much like the poppy. Here in the UK we too celebrate our fallen war service people with the poppy. Pretty card! another flower that almost looks like the poppy! :) Thanks so much for sharing your creativity! Beautiful card! Thanks for the info on the verdigris technique! Love the card, love the flower and the shadowing on both the card and the flower. Sharon ,I am so glad I did the top of the hop last. It looks like you added you PS later. I loved learning about the red poppy ! I never knew anything about that! Thanks you so much for sharing that story with us. Your card is beautiful. But now has so much more meaning to me and many . Take care! I'm definitely going to have to try that technique sometime after seeing your fab take on it! Really pretty card, Sharon! Thanks for sharing the technique you used!